It's a beautiful sunny Saturday morning here in Sydney and I really should be outside enjoying the weather but my copics are calling me! Also my Create a Smile exclusive Sending Sunshine Kit finally arrived in the post yesterday! So glad it is finally here, I have been waiting patiently for it for two whole weeks. Here's hoping I can complete at least one card this weekend! But before I start playing with my goodies I would like to share the card I finally completed yesterday. A few months ago I came across Gerda Steiner Designs, she has some fantastic digital and clear stamps. If you get the chance you should definitely check out her shop - she has a few freebies in there too :) I have been meaning to play along in her progressive challenge for the last couple of months but just haven't had the time. This month, however, I couldn't resist purchasing the stinkin' cute image as....it's stinking cute! I just had to play along!! In true fashion I have linked up at the very last minute! 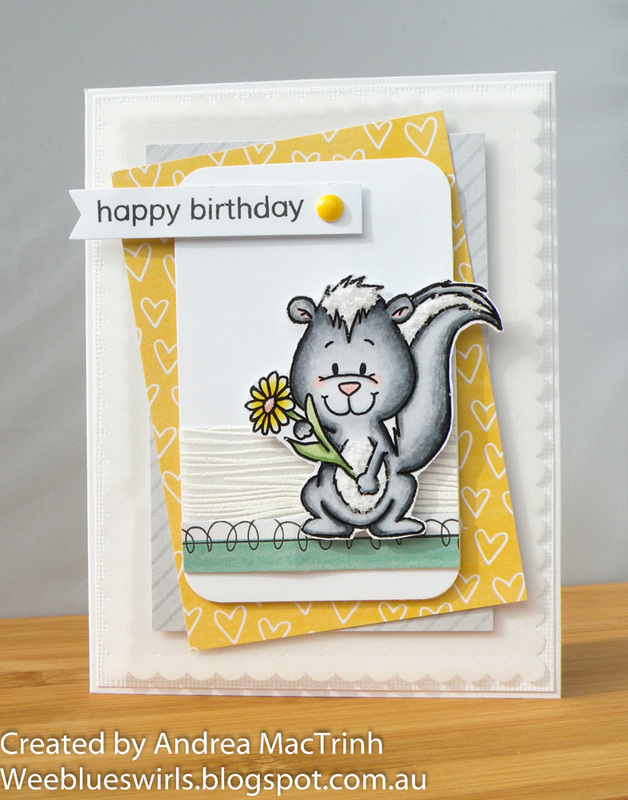 I wanted the card to have a fresh and spring feel to decided to use some yellow, which I matched up with some soft grey and vellum. I ended up with a lot of layers on this card - six or seven if you include the image and sentiment - tonnes of dimension! This super cute skunk was coloured in with copics and some flower soft was added to his head, tail and tummy. I then fuzzy cut him out. I mounted him onto a scrap of white woodgrain embossed vellum. The little green patch he is standing on is actually the perforated edging of one of the sheets in the rise and shine paper pad - I don't like to waste anything! Thanks for visiting, hope to see you again soon. Enjoy your Saturday. Super cute image! Love your pretty card. Thanks for joining us at Seize the Birthday! How exciting to get your kit, have seen it on Facebook and looks amazing. Hope you get a chance to use it and link your card to the ATSM challenge. Just love this little cutie (or 'stinky') and you've coloured him beautifully. Love the paper layers too, especially the waffle edge. So glad you joined us at ATSM this week! Oh, dear me! This is just TOO CUTE! Absolutely adorable card! I love it! Thanks so much for playing along with us for the Anything Goes Challenge on the Simon Says Stamp Wednesday Challenge Blog! Oh, how cute! Beautiful coloring and I love how you layered the papers! So glad you shared this with us at ATSM this week! Beautiful Card. Thank you so much for joining us at Crafty Catz Challenges.